This is part 12 of Categories for Programmers. Previously: Declarative Programming. See the Table of Contents. It seems like in category theory everything is related to everything and everything can be viewed from many angles. Take for instance the universal construction of the product. Now that we know more about functors and natural transformations, can we simplify and, possibly, generalize it? Let us try. The construction of a product starts with the selection of two objects a and b, whose product we want to construct. But what does it mean to select objects? Can we rephrase this action in more categorical terms? Two objects form a pattern — a very simple pattern. We can abstract this pattern into a category — a very simple category, but a category nevertheless. It’s a category that we’ll call 2. It contains just two objects, 1 and 2, and no morphisms other than the two obligatory identities. 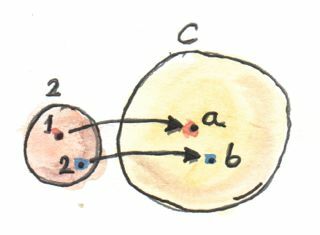 Now we can rephrase the selection of two objects in C as the act of defining a functor D from the category 2 to C. A functor maps objects to objects, so its image is just two objects (or it could be one, if the functor collapses objects, which is fine too). It also maps morphisms — in this case it simply maps identity morphisms to identity morphisms. What’s great about this approach is that it builds on categorical notions, eschewing the imprecise descriptions like “selecting objects,” taken straight from the hunter-gatherer lexicon of our ancestors. And, incidentally, it is also easily generalized, because nothing can stop us from using categories more complex than 2 to define our patterns. But let’s continue. The next step in the definition of a product is the selection of the candidate object c. Here again, we could rephrase the selection in terms of a functor from a singleton category. And indeed, if we were using Kan extensions, that would be the right thing to do. But since we are not ready for Kan extensions yet, there is another trick we can use: a constant functor Δ from the same category 2 to C. The selection of c in C can be done with Δc. Remember, Δc maps all objects into c and all morphisms into idc. Now we have two functors, Δc and D going between 2 and C so it’s only natural to ask about natural transformations between them. Since there are only two objects in 2, a natural transformation will have two components. 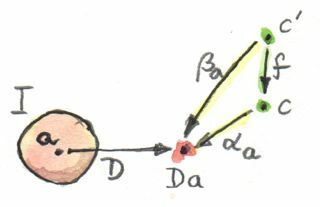 Object 1 in 2 is mapped to c by Δc and to a by D. So the component of a natural transformation between Δc and D at 1 is a morphism from c to a. We can call it p. Similarly, the second component is a morphism q from c to b — the image of the object 2 in 2 under D. But these are exactly like the two projections we used in our original definition of the product. So instead of talking about selecting objects and projections, we can just talk about picking functors and natural transformations. It so happens that in this simple case the naturality condition for our transformation is trivially satisfied, because there are no morphisms (other than the identities) in 2. A generalization of this construction to categories other than 2 — ones that, for instance, contain non-trivial morphisms — will impose naturality conditions on the transformation between Δc and D. We call such transformation a cone, because the image of Δ is the apex of a cone/pyramid whose sides are formed by the components of the natural transformation. The image of D forms the base of the cone. In general, to build a cone, we start with a category I that defines the pattern. It’s a small, often finite category. 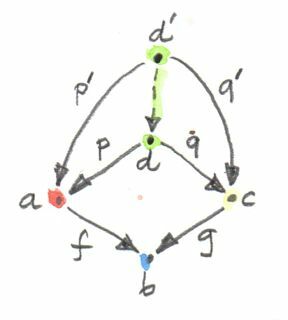 We pick a functor D from I to C and call it (or its image) a diagram. We pick some c in C as the apex of our cone. We use it to define the constant functor Δc from I to C. A natural transformation from Δc to D is then our cone. For a finite I it’s just a bunch of morphisms connecting c to the diagram: the image of I under D.
Naturality requires that all triangles (the walls of the pyramid) in this diagram commute. Indeed, take any morphism f in I. The functor D maps it to a morphism D f in C, a morphism that forms the base of some triangle. 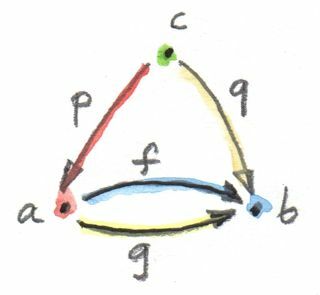 The constant functor Δc maps f to the identity morphism on c. Δ squishes the two ends of the morphism into one object, and the naturality square becomes a commuting triangle. 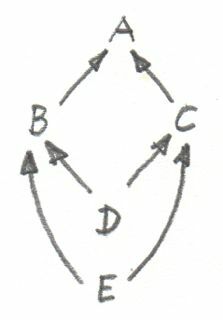 The two arms of this triangle are the components of the natural transformation. So that’s one cone. What we are interested in is the universal cone — just like we picked a universal object for our definition of a product. There are many ways to go about it. For instance, we may define a category of cones based on a given functor D. Objects in that category are cones. Not every object c in C can be an apex of a cone, though, because there may be no natural transformation between Δc and D.
This condition translates, in the general case, to the condition that the triangles whose one side is the factorizing morphism all commute. 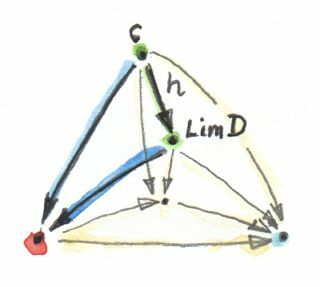 The commuting triangle connecting two cones, with the factorizing morphism h (here, the lower cone is the universal one, with Lim D as its apex). We’ll take those factorizing morphisms as the morphisms in our category of cones. It’s easy to check that those morphisms indeed compose, and that the identity morphism is a factorizing morphism as well. Cones therefore form a category. Now we can define the universal cone as the terminal object in the category of cones. The definition of the terminal object states that there is a unique morphism from any other object to that object. In our case it means that there is a unique factorizing morphism from the apex of any other cone to the apex of the universal cone. We call this universal cone the limit of the diagram D, Lim D (in the literature, you’ll often see a left arrow pointing towards I under the Lim sign). Often, as a shorthand, we call the apex of this cone the limit (or the limit object). The intuition is that the limit embodies the properties of the whole diagram in a single object. For instance, the limit of our two-object diagram is the product of two objects. The product (together with the two projections) contains the information about both objects. And being universal means that it has no extraneous junk. There is still something unsatisfying about this definition of a limit. I mean, it’s workable, but we still have this commutativity condition for the triangles that are linking any two cones. It would be so much more elegant if we could replace it with some naturality condition. But how? We are no longer dealing with one cone but with a whole collection (in fact, a category) of cones. If the limit exists (and — let’s make it clear — there’s no guarantee of that), one of those cones is the universal cone. For every other cone we have a unique factorizing morphism that maps its apex, let’s call it c, to the apex of the universal cone, which we named Lim D. (In fact, I can skip the word “other,” because the identity morphism maps the universal cone to itself and it trivially factorizes through itself.) Let me repeat the important part: given any cone, there is a unique morphism of a special kind. We have a mapping of cones to special morphisms, and it’s a one-to-one mapping. This special morphism is a member of the hom-set C(c, Lim D). The other members of this hom-set are less fortunate, in the sense that they don’t factorize the mapping of cones. 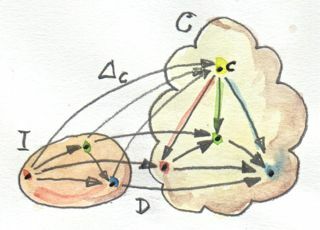 What we want is to be able to pick, for each c, one morphism from the set C(c, Lim D) — a morphism that satisfies the particular commutativity condition. Does that sound like defining a natural transformation? It most certainly does! But what are the functors that are related by this transformation? Notice the inversion in the order of c and c' characteristic of a contravariant functor. It’s relatively easy to show that those components indeed add up to a natural transformation. What I have just done is to show you that we have two (contravariant) functors from C to Set. I haven’t made any assumptions — these functors always exist. Incidentally, the first of these functors plays an important role in category theory, and we’ll see it again when we talk about Yoneda’s lemma. There is a name for contravariant functors from any category C to Set: they are called “presheaves.” This one is called a representable presheaf. The second functor is also a presheaf. Let me remind you what a natural isomorphism is. It’s a natural transformation whose every component is an isomorphism, that is to say an invertible morphism. I’m not going to go through the proof of this statement. The procedure is pretty straightforward if not tedious. When dealing with natural transformations, you usually focus on components, which are morphisms. In this case, since the target of both functors is Set, the components of the natural isomorphism will be functions. These are higher order functions, because they go from the hom-set to the set of natural transformations. Again, you can analyze a function by considering what it does to its argument: here the argument will be a morphism — a member of C(c, Lim D) — and the result will be a natural transformation — a member of Nat(Δc, D), or what we have called a cone. This natural transformation, in turn, has its own components, which are morphisms. So it’s morphisms all the way down, and if you can keep track of them, you can prove the statement. The most important result is that the naturality condition for this isomorphism is exactly the commutativity condition for the mapping of cones. As a preview of coming attractions, let me mention that the set Nat(Δc, D) can be thought of as a hom-set in the functor category; so our natural isomorphism relates two hom-sets, which points at an even more general relationship called an adjunction. We’ve seen that the categorical product is a limit of a diagram generated by a simple category we called 2. There is an even simpler example of a limit: the terminal object. The first impulse would be to think of a singleton category as leading to a terminal object, but the truth is even starker than that: the terminal object is a limit generated by an empty category. A functor from an empty category selects no object, so a cone shrinks to just the apex. The universal cone is the lone apex that has a unique morphism coming to it from any other apex. You will recognize this as the definition of the terminal object. The way to think about it is that, if we restrict our attention to Set, the image of the function p selects a subset of a. When restricted to this subset, the functions f and g are equal. Notice that (p t) defines a straight line in the two-dimensional plane. Along this line, the two functions are equal. An equalizer can thus be used to solve equations of the type f x = g x. But it’s much more general, because it’s defined in terms of objects and morphisms rather than algebraically. This diagram is often called a cospan. A pullback is a universal cone of this shape. In this case, the choice of c is irrelevant (as long as it’s not an empty set), so we can take it to be a singleton set. The set a could, for instance, be the set of three-dimensional vectors, and f the vector length. Then the pullback is the set of pairs (v, ()), where v is a vector of length 1.23 (a solution to the equation sqrt (x2+y2+z2) = 1.23), and () is the dummy element of the singleton set. But pullbacks have more general applications, also in programming. For instance, consider C++ classes as a category in which morphism are arrows that connect subclasses to superclasses. We’ll consider inheritance a transitive property, so if C inherits from B and B inherits from A then we’ll say that C inherits from A (after all, you can pass a pointer to C where a pointer to A is expected). Also, we’ll assume that C inherits from C, so we have the identity arrow for every class. This way subclassing is aligned with subtyping. 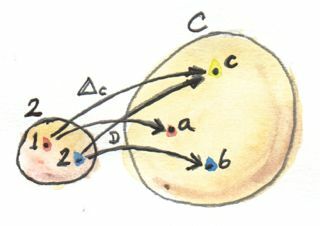 C++ also supports multiple inheritance, so you can construct a diamond inheritance diagram with two classes B and C inheriting from A, and a fourth class D multiply inheriting from B and C. Normally, D would get two copies of A, which is rarely desirable; but you can use virtual inheritance to have just one copy of A in D.
What would it mean to have D be a pullback in this diagram? It would mean that any class E that multiply inherits from B and C is also a subclass of D. This is not directly expressible in C++, where subtyping is nominal (the C++ compiler wouldn’t infer this kind of class relationship — it would require “duck typing”). But we could go outside of the subtyping relationship and instead ask whether a cast from E to D would be safe or not. This cast would be safe if D were the bare-bone combination of B and C, with no additional data and no overriding of methods. And, of course, there would be no pullback if there is a name conflict between some methods of B and C.
with t a free type variable. Just like all constructions in category theory, limits have their dual image in opposite categories. When you invert the direction of all arrows in a cone, you get a co-cone, and the universal one of those is called a colimit. Notice that the inversion also affects the factorizing morphism, which now flows from the universal co-cone to any other co-cone. Cocone with a factorizing morphism h connecting two apexes. A typical example of a colimit is a coproduct, which corresponds to the diagram generated by 2, the category we’ve used in the definition of the product. Both the product and the coproduct embody the essence of a pair of objects, each in a different way. Just like the terminal object was a limit, so the initial object is a colimit corresponding to the diagram based on an empty category. The dual of the pullback is called the pushout. It’s based on a diagram called a span, generated by the category 1<-2->3. 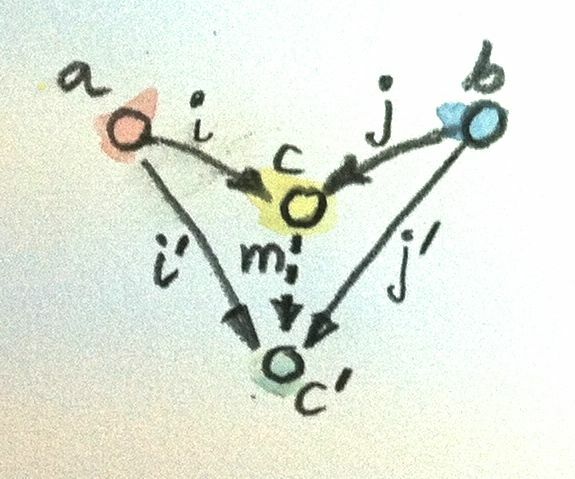 I said previously that functors come close to the idea of continuous mappings of categories, in the sense that they never break existing connections (morphisms). The actual definition of a continuous functor F from a category C to C’ includes the requirement that the functor preserve limits. Every diagram D in C can be mapped to a diagram F ∘ D in C’ by simply composing two functors. 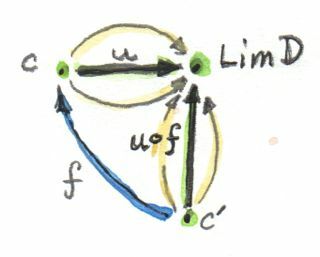 The continuity condition for F states that, if the diagram D has a limit Lim D, then the diagram F ∘ D also has a limit, and it is equal to F (Lim D). Notice that, because functors map morphisms to morphisms, and compositions to compositions, an image of a cone is always a cone. 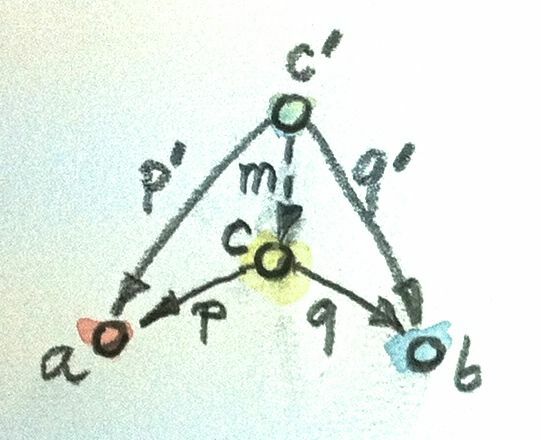 A commuting triangle is always mapped to a commuting triangle (functors preserve composition). The same is true for the factorizing morphisms: the image of a factorizing morphism is also a factorizing morphism. So every functor is almost continuous. What may go wrong is the uniqueness condition. The factorizing morphism in C’ might not be unique. There may also be other “better cones” in C’ that were not available in C.
When its second argument is fixed, the hom-set functor (which becomes the representable presheaf) maps colimits in C to limits in Set; and when its first argument is fixed, it maps limits to limits. Indeed, any function of Either b c is implemented as a case statement with the two cases being serviced by a pair of functions. I know what you’re thinking: You don’t need category theory to figure these things out. And you’re right! Still, I find it amazing that such results can be derived from first principles with no recourse to bits and bytes, processor architectures, compiler technologies, or even lambda calculus. If you’re curious where the names “limit” and “continuity” come from, they are a generalization of the corresponding notions from calculus. In calculus limits and continuity are defined in terms of open neighborhoods. Open sets, which define topology, form a category (a poset). How would you describe a pushout in the category of C++ classes? Show that the limit of the identity functor Id :: C -> C is the initial object. Subsets of a given set form a category. A morphism in that category is defined to be an arrow connecting two sets if the first is the subset of the second. What is a pullback of two sets in such a category? What’s a pushout? What are the initial and terminal objects? Can you guess what a coequalizer is? Show that, in a category with a terminal object, a pullback towards the terminal object is a product. Similarly, show that a pushout from an initial object (if one exists) is the coproduct. I’d like to thank Gershom Bazerman for checking my math and logic, and André van Meulebrouck, who has been volunteering his editing help. Shouldn’t the double-colon be an equals sign here? Do limits have to be unique? I’m guessing the answer is “no” since products only have to be “unique up to isomorphism”. Or is there some way the limit gets around this? As with all universal constructions, they are unique up to a unique isomorphism. Do these words “limits”, “Continuity” come from analysis? How do they coincide when taking analysis from the the point of view of Category? @ahala: Yes, indeed. More specifically from topology. 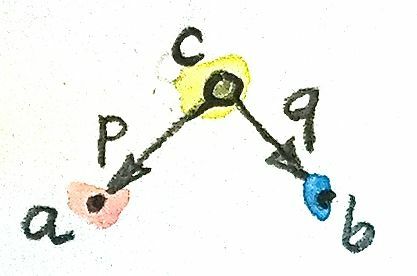 Open subsets form a category in a topological space, with inclusions playing the role of morphisms. Top is a category of topological spaces with continuous functions as morphisms. 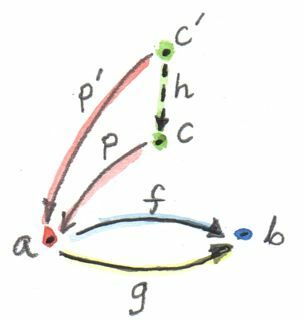 Let G be the functor from C to Set that maps every c in C to the set of cones (for functor D) with apex c. IOW, G(c) = Nat(Δc, D). Next, for any X in C, let FX be the functor from C to Set that maps every c in C to the set C(c, X). Also, for any X in C, let PX stand for the assertion “there exists a natural isomorphism between the functors FX and G.” Finally, let T denote the theorem stated in the “Limit as natural isomorphism” section (right after “So without further ado, here’s the conclusion:…”. I can paraphrase T (or rather, my understanding of it) in two not-obviously-equivalent ways. Here’s the first one: “The functor D has a limit with apex X if and only if PX.” And the second one: “Any cone with apex X is a limit of D if and only if PX.” Maybe these two formulations can be made to coincide with a suitable insertion of “up to [unique] isomorphism” somewhere, but the question still remains: is either of them indeed equivalent to T? @weekendwarrior: Your first question boils down to: Is the limiting cone unique? The answer is: Like every universal construction, it’s unique up to unique isomorphism. As for your second question, I added a parenthetical remark that should clear the confusion (the image of g is not a set — it’s a number — an element of the set of numbers). We must be using different definitions. I’ve always seen the “image of a function” g defined as the subset of the function’s codomain consisting of the elements g(x), as x ranges over the function’s domain. In the example it so happens that the set corrsponding to this description is a singleton, but it is still a set. But maybe we’re talking past each other. I think your point is that in the example, the category C where the pullback lives is not the category Set, but rather something else. Haskell types? If so, I’m even more curious now to know what exactly is the pullback (i.e. the object d and morphisms p and q) in that example. You’re right about the image. Thank you for keeping me on my toes. I rewrote the example so it’s more explicit. I hope it helps. Yes, the new version is very clear. Thanks! When you say that the terminal object is the limit making I the empty category, how does delta_c picks the apex of the cone? If I is the empty category no object of I can be used to get to c using delta_c. What am I missing? @Juan: Good point! This is one of these tricky limiting cases, like dividing zero by zero. On the one hand, you can’t get to c because the source category is empty. On the other hand, the constant functor ignores its argument, so it shouldn’t matter. Let’s analyze the right hand side. There is only one functor from the empty category to C — the empty functor. So both Δc and D are empty functors. There is only one natural transformation between empty functors — the identity natural transformation. The right hand side is therefore a singleton set, for any choice of c. Which means that all the hom-sets C(c, Lim D) must be singletons. That makes Lim D the terminal object. Thanks for your explanation. I can’t say I fully understand it but at least makes perfect sense. Somehow this reminds me of an scene of the film Matrix when a child says: “there is no spoon”. But here we have an identity natural transformation between two no-spoons (empty functors). How is it that a cone is entirely determined by its apex when D is fixed? Couldn’t there be multiple natural transformations from Δc to D, which means multiple cones corresponding to the same c? Shimin Guo: You’re absolutely right. In fact I later talk about a set of natural transformations Nat(Δc, D). I’m removing this statement from the post. Thank you for spotting this. Sorry to come in so long after the post went up, but I wanted to point out a slight error in terminology. When discussing pull-backs, the diagram you’re talking about is related to spans, but is not ITSELF a span. Given A1 and A2, the spans between them form a category as you might expect: morphisms are the ones taken from hom(B, B’) that make both side triangles commute. They look like product cones, actually. Does this mean that spans form a category? well, not quite. The problem is that this composition by pull-backs isn’t quite associative. But if we consider the morphisms between spans (the ones that look like product cone morphisms from before), then this composition of spans (as 1-morphisms) is associative up to a canonical 2-morphism, making this a “weak” 2-category. The specific 2-morphism is defined by a natural isomorphism called the “associator”, the existence of which should follow from other material in this very post! 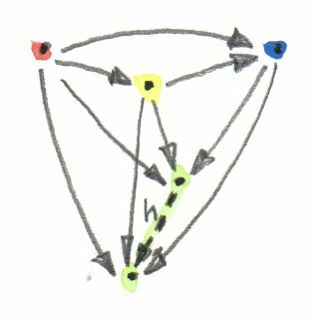 Similarly, in push-outs the diagrams you mention are not quite co-spans, but the ideas are related, mutatis mutandis, as above. You’re right, I confused spans with cospans. Fixed! I just talked about bicategories in my last lecture. This would be a good example. BTW, I had no idea latex would work in WordPress. Must be a new thing. I used to use it when I was still math-blogging at unapologetic.wordpress.com. Seems to be on by default here! You mention “category 13” in your post where you introduce spans. I assume that’s an html quoting error, where the arrows have turned into comments and eaten the object “2”. @eschnett: Exactly! Thanks for noticing. After reviewing the Wikipedia article on coequalizer, as well as a few of the references it points to, I’m still not clear on its significance in programming. Can you offer any hints? This blog post by Phil Freeman provides some intuitions about equalizers and coequalizers. I would like to dive deeper into your Hindley-Milner pullback example. Do you have any references I can look at? I’m really enjoying the videos, thanks for the good work! And obviously one of them must be wrong. @karkunow: Yes, this is an ongoing problem. I think I will, from now on, use precompose f to mean “first act with f” which, incidentally means that f will be on the right of the dot (that’s where the confusion comes from: it’s “post” dot). Hello, I have watched ur videos(first part), and these videos(first part) is very interesting to me.I am a programmer,I am very interesting in Functor, Monad, product and co-product. Then I decided to watched the rest videos(second part).But I find these stuff, like limit and free monoid, is so abstract,and I don’t know what is the use of these things? I am curious what problem can these stuff solved? How I can benefit from learning these stuff to help me understating world? I don’t understand this: “This special morphism is a member of the hom-set C(c, Lim D). The other members of this hom-set are less fortunate, in the sense that they don’t factorize the mapping of cones.” It seems to me that any morphisms from c to Lim D would have to factorize the mapping of cones. Am I on the wrong layer of abstraction? I’m taking Lim D to be the apex of the cone of the limit (a single object or set of isomorphic objects), and c to be the single chosen object in C to be the apex of some cone. for all i. That’s the special member of C(c, Lim D) I’m talking about. If you try any other morphism h' in C(c, Lim D), you’ll see that there is an i such that pi . h' is not equal to qi. It might help to keep in mind that a cone is defined not only by its apex, but also by its edges (projections). It’s possible to have more than one cone with the same apex but different edges. I won’t lie to you. There are some things in category theory that have immediate application in programming, and others that don’t. Here’s some motivation why you might want to learn things that are not immediately useful. You can be a professional programmer who is very skilled in creating beautiful programs for your clients. It’s a wonderful gift and it’s very appreciated. But what’s an even rarer gift is the ability to innovate. Innovation is not something that can be taught the same way you teach a language or an algorithm. An innovator has to have an open mind and the ability to make connections between previously unrelated things. If you only learn things that have immediate application, you won’t be challenging yourself. You’ll be stuck in a rut. You might miss a great opportunity. Doesn’t the commutativity condition come from the implementation of contra map for Nat(Δc, D)? There are two commutativity conditions. One is internal to the cone: that one is taken care by the naturality of the transformation between Δc and D. The other is the the commutativity of the triangles that sit between two cones — that’s the one that enforces the factorization of two sets of projections through h. That one is taken care by the naturality condition between C(c, Lim D) and Nat(Δc, D). Am I on the right track when I say that when we have two categories I and C, it is irrelevant which objects and morphisms are present in category I as the Id functor would map those objects and morphisms to themselves (that is in category I). This would mean that we are only left with the apexes of cones in category C.. Hint: Replace the category I with C.
In the category [C, C] there is always a unique natural transformation between the identity functor Id:: C -> C and any other functor present in [C, C]. Why don’t you just follow the definition of a limit, replacing I with C and the functor D with Id? There’s really not much more to it. I was on the wrong path. 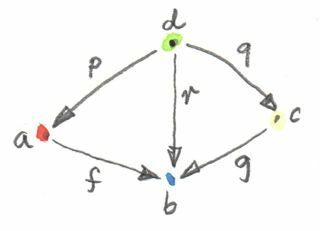 The image of the Id functor is just C itself. Only initial objects can be the apex of a cone where the whole category is the base as there is a morphism to any object in the category only from the initial object(s) in a category i.e. there can be only a natural transformation between the Id functor and Δc when the image of Δc is an initial object. there is a unique factorizing morphism from c’ to c. In this case any candidate is guaranteed to be a limiting cone. You’re on the right track. But there’s still one problem: How do you know that the morphism from the apex c of the limiting cone to any other object is unique (that’s part of the definition of the initial object, but not part of the definition of a cone). Hint: All triangles with the apex c commute, because they form the sides of the limiting cone. A cone is a natural transformation between functor Δc and functor Id in this case. This implies the morphisms from the apex c of the limiting cone to any other object are unique right? Those morphisms are the components of the natural transformation. Not really, a natural transformation between functors f and g is a selection of morphisms, one per hom-set C(f a, g a). Uniqueness would require that those hom-sets be singletons, which, in general, is not true. What is guaranteed to be unique is the morphism from any other cone to the limiting cone– it’s a morphism that makes appropriate triangles commute. Again, there may be other morphisms between those apices that don’t make those triangles commute. This is not possible in our case as far as I can see, because when switching to the category of our cones of interest, the objects are all cones of which the apex is an initial object in category C.
The morphims in that cone category are the unique morphisms from one initial object to another. There can’t be other morphisms between the apices. Keep in mind what you are trying to prove: Suppose that the limit of the identity functor exists. Show that its apex defines the initial object. You can’t assume that the initial object exists–you have to prove it. I guess I can still guarantee the morphisms between apices are unique without using the definition of the initial object, as the morphisms between the apices are (as you hinted) also part of the limiting cone. 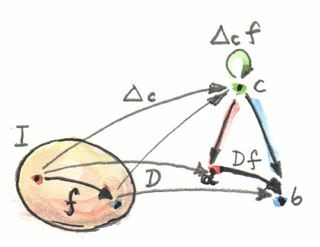 The part of the definition of a cone that states that all triangles the pyramid consists of must commute (enfored by the naturality condition between functor Δc and the Id functor) makes those morphisms between apices unique. I’m not sure what your question is. 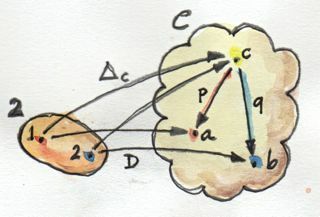 Projections are morphisms, and there may be many morphisms between the same two objects. Think of how many functions there are between any two types.